The Premier 20 in. 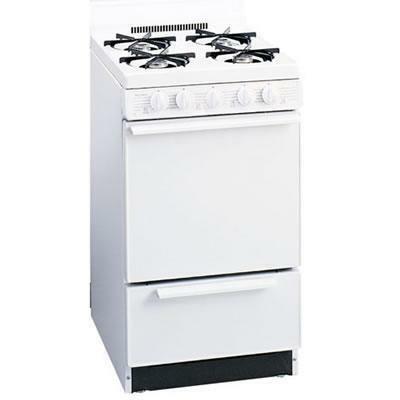 Gas Pilot Range (GAK 100O) is a great range for your dorm, apartment or any space with a small kitchen. Features four 9,100 BTU top burners and a 17,000 BTU oven burner which provide for all types of cooking. The surface element indicator light lets you know when the burners are on and the convenient storage drawer is the perfect place for cookie sheets, pots and pans. Front controls eliminates reaching over hot pans to adjust temperatures and two oven racks, broiler pan and tray are perfect for all your baking and broiling needs. Anti-tip bracket attaches to the floor for safe installation, and the 4" porcelain backguard makes this oven easy to clean.